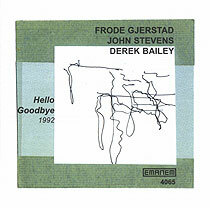 Frode Gjerstad, alto saxophone; Derek Bailey, amplified guitar; John Stevens, percussion, mini-trumpet. Recorded at Folken, Stavanger, Norway in October 1992. Cover drawing/collage (reproduced above) by Camilla Sørvik.